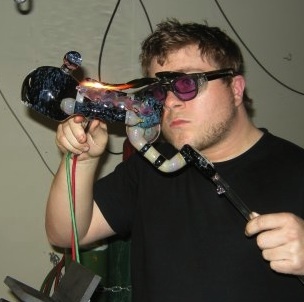 To help all of us non-glass artists better understand the industry, evolution and art and science behind how our pipes, bubblers and bongs are made we’ve asked one of Colorado’s most prominent and best-known artists to take on a quasi-regular column we’d like to call: Glass Class. This week, our glass guide Scott “Trikky” Saed, runs us through percolation, diffusion and what all those terms mean (and don’t). I was making some tubes (bongs) on the lathe the other day, and I started thinking about all the different terminology that gets thrown around when talking about or trying to describe a tube to someone else. Things like “diffused” “percolated” and “filtered” often find themselves getting used interchangeably to describe, what is often the same action. I thought it would be good to take a second and try to clear the air as to how to refer to the various parts of a tube. This is meant to be a guide to how we refer to it in the pipe-making world, not the scientific terminology. First off, in pipe-making, we often talk about the most efficient ways to pass the smoke or vapor of a good bong rip through the water. We refer to this action of the smoke passing through the water as “percolation.” Anytime the smoke passes through water, even if it’s a second, third, or even fourth time, we call it percolating, and whatever device is being used to facilitate the smokes passage, a percolator. For example, when I was making tubes on the lathe, I was making a couple of tubes I wanted the filter the smoke twice on, I decided, in this case to use a “circulator percolator,” or “circ perc”. The second chamber of percolation causes the smoke to be much less harsh, but does filter out a bit more THC (and other particulates) along the way. When adding percolators to help with filtration, we are “diffusing” the smoke within the tube. In pipe-making we use the term diffusing to refer to the action of the smoke being broken into smaller particles by a device as it’s being pulled through the airway of the pipe, with the goal being to expose the maximum possible surface area to either air or water, thus maximizing temperature reduction. Oftentimes, in pipe-making, we use it while describing how to break up the smoke best when passing it through water. The more diffused it is, the more efficiently it is cooled, the less harsh the smoke when it hits your lungs. 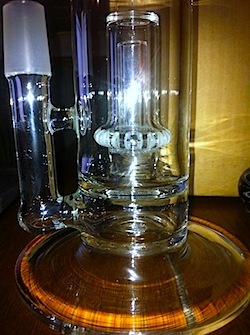 A diffuser could be anything from a downstem with additional holes placed along the sides at the bottom for more smoke to pass through a different hold, thus breaking up the smoke into smaller bubbles, or the previously discussed “circ perc” with slits cut all the way around the percolator to diffused the smoke greatly. 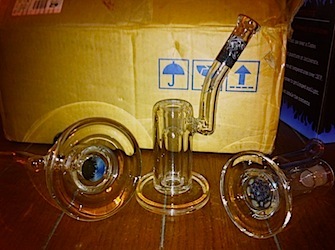 However, this must always be balanced with the size of the pipe, the glassblowers’ ability to build a more complex diffuser, and the amount of filtration desired. These terms are not meant to apply to every single glassblower or consumer in ever single area of the world. Much like skateboarding or snowboarding, the names of various techniques are different, often based on location. What’s used as a term in New York to make tubes might not be used in San Francisco by another similar, but separate tube company. These terms serve as a basis for discussion, and a frame of reference for us to use to discuss this art as a community. It’s going to be more and more important to be able to communicate intelligently as a community as pipe-making is being more widely accepted as a main-stream, cohesive form of art. Scott “Trikky” Saed is a glassblower located in Colorado. You can find his work locally as well as nationally.